You have to love winter in order to visit Saguenay–Lac-Saint-Jean in the spring. The landscape can occasionally see a dusting of snow long after spring has officially begun. It still covers the region’s forest floors while people in Quebec City have already shed their bulky layers. The period between the cold winter months and warmer weather can drag on sometimes. Every year, it becomes anyone’s guess as to when Lac Saint-Jean—almost two times larger than Lake Geneva in Switzerland—will be “calé,” the local term for thawed out. April or May? One thing’s for sure: once it happens, it’ll make the headlines and be the talk of the town for days! 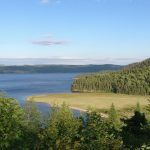 Venture north direction Jonquière, in Saguenay, and marvel at the wilderness. I grew up in Saint-Félicien. 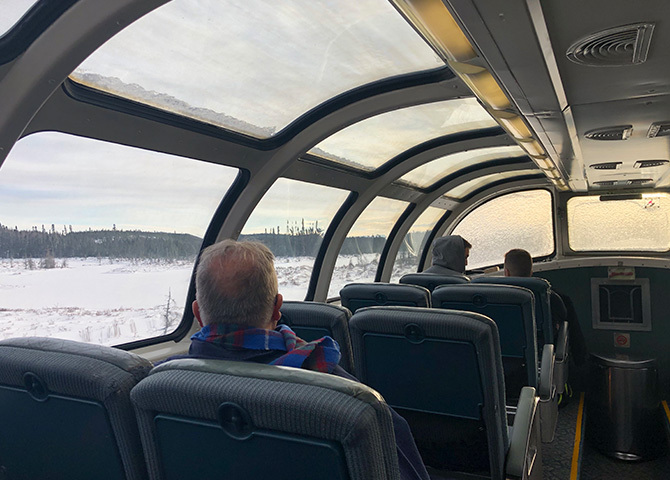 It’s about forty kilometres from Chambord train station, which is where passengers who want to explore Lac Saint-Jean disembark. My childhood is tied to the Saint-Félicien wildlife zoo that opened in 1960, and where my parents took me every summer. 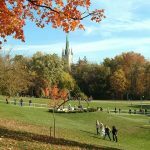 Even after setting new roots in Montréal, I went there as often as possible. Now called Zoo Sauvage, it’s open year-round and houses animals both native to Quebec and from the coldest reaches of the planet. Almost 1,000 creatures of 80 different species live together on the site’s 485 hectares. For a bit extra, you can get a behind-the-scenes-tour and see how pampered the animals are. The area that’s changed the least since my first visit four decades ago? The Nature Trail Park. 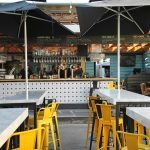 The space has been improved, but the core experience remains the same. In this area, it’s the humans who are caged and the animals who are free. You hop on board a mesh-caged train that lets you see the animals strolling along at their own pace. 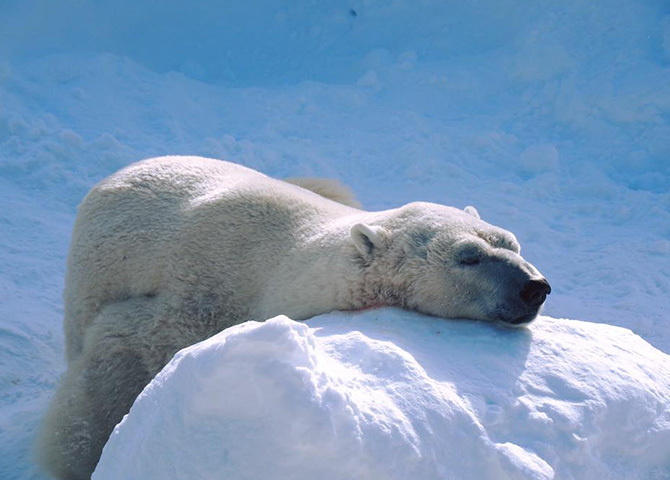 One time in the spring, I even saw a bear who had just left his den after hibernating all winter. I no doubt have the same groggy demeanor when I have to get up really early! Several new attractions have been added over the years. During the summer, there’s the Anima Lumina illuminated night walk, created by Moment Factory, which has been a wild success since it debuted in 2016. 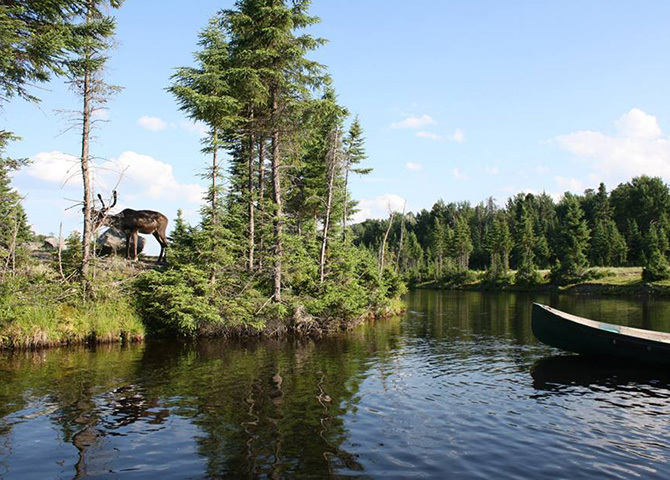 Towering caribou can be spotted safely from mere feet away while canoeing on Lac Montagnais. My favourite? Adventure in the land of the caribou. This summertime package lets you spend a night in a prospector tent right in the middle of the nature trails. Highlights of the experience include canoeing on Lac Montagnais and spotting formidable muskox on the shore. The ultimate high point of this all-natural entertainment, however, is definitely waking up surrounded by caribou. My mother, my daughter and I aren’t likely to forget those memories! Even further north, in Girardville specifically, Parc Mahikan also promises emotion-packed experiences. Once again accompanied by my family, I spent the night in a small ecolodge near a pack of wolves. Hearing them howl at night and seeing their eyes glowing in the dark was quite stunning! Gilles Granal and Marie-Christine Debail, originally from Marseille, have lived in the region for more than twenty years, and built this special place while starting their family. 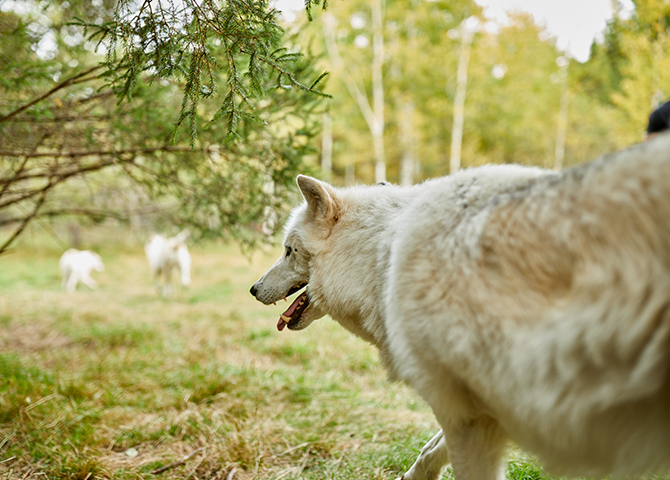 They offer many outdoor activities, such as dog-sledding in the winter and canoeing in the summer, but the wolf observation is especially exciting. The initial goal was to help people understand these canines. “They’re misunderstood animals,” says Gilles Granal, a physical education teacher by trade. “The point wasn’t to make them an object of either worship or hatred. We wanted people to be able to see wolves, since they’re such a difficult animal to spot in the forest.” You can sleep amidst the wolves both in winter and in summer. How magical! If you ever dream about what it must feel like to be the only person on Earth, then Equinox Aventure may have the perfect place for you. Located near Connelly Island, the Igloft is situated atop the lake ice in winter. In the summer, it transforms into the Iloft, which sits on the water, though you’ll have to wait until mid-June for it to become accessible by kayak. Getting off at Saguenay—two stations past Chambord—makes it easy to organize various trips. Le Parc national des Monts-Valin is undoubtedly one of the most beautiful recreational areas in the region. In winter, the trees become gigantic ghosts that you can explore while snowshoeing or cross-country skiing. 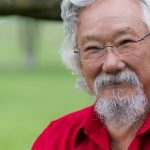 In summer, you can walk or bike the trails, canoe or stand-up paddle board on the water and even fish for arctic char. 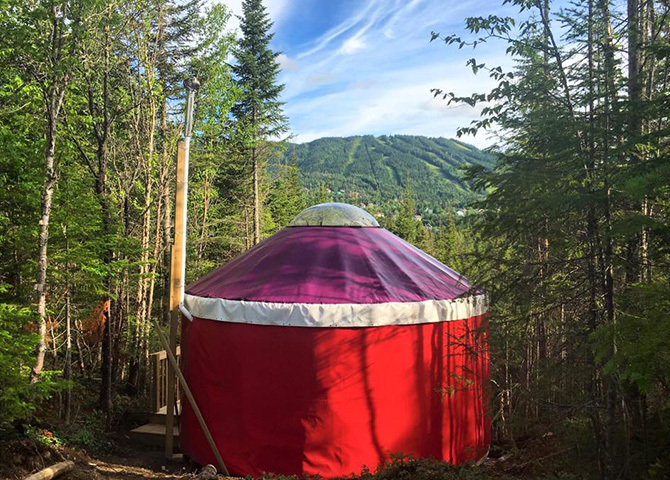 Take nature to the extreme by cozying up in a yurt pitched on a mountainside. One intriguing place is Imago Village, which offers an amazing outdoor immersion in nature. The yurts, which were made in the region, are pitched among the spectacular scenery of Mount Valin, and face the Valinouët ski resort. There, you can ski in natural powder up until the end of March. It also happens to be only a few minutes away from L’Éternel Spa, which is open year-round. Once the earth has thrown of its thick white coat, it’s time for thrill-seekers to turn to mountain biking. Trails are accessible right next to the yurts. Heading toward Tadoussac, Canopée Lit in Sacré-Cœur also lives up to the hype. Established by another French couple who fell in love with Quebec, the site gives you the opportunity to sleep in a treetop cabin all year round. From the end of May until autumn, transparent bubbles are available so you can sleep under the stars… and keep out the mosquitos. 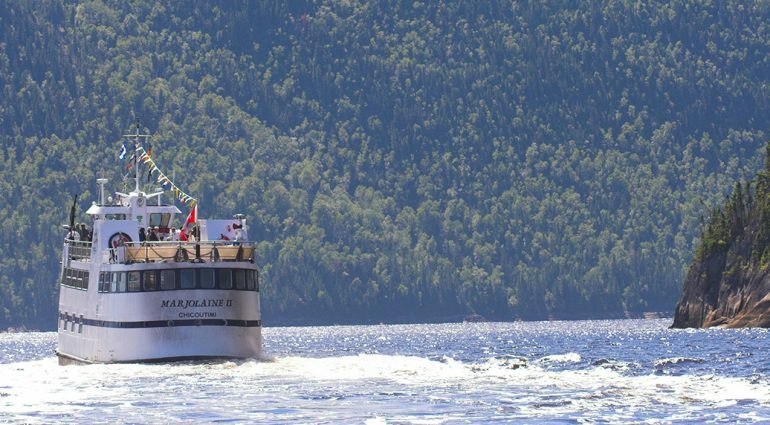 Planning to visit Saguenay-Lac-Saint-Jean in the summer? You can bring your bike on board the Montréal – Jonquière train for free. Combine it with the Fjord Marine Shuttle and travel the region car-free. 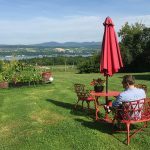 It’s a great way to explore the region on the Véloroute des bleuets (Chambord stop) and the Véloroute du Fjord (Jonquière stop)!